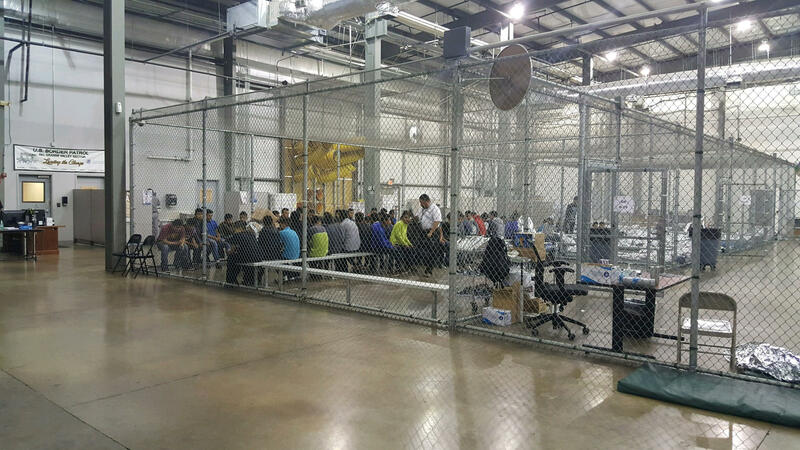 In a handout photo, the inside of a U.S. Customs and Border Protection detention facility shows detainees inside fenced areas at Rio Grande Valley Centralized Processing Center in Rio Grande City, Texas, on June 17. The seven minutes of audio, recorded last week, provide rare insight into one of the facilities where children are temporarily held while their parents remain in immigration detention. Amid the wailing children, a Border Patrol officer is heard saying in Spanish: "Well, we have an orchestra here. What's missing is a conductor." The children had been held at the unidentified facility less than 24 hours. An unnamed source made the recording and provided it to Jennifer Harbury, a civil rights attorney who works in Texas' Rio Grande Valley. Harbury, in turn, provided it to Ginger Thompson, a senior reporter with the investigative news organization ProPublica. Harbury told CBS News that the person who provided the tape to her is a person known to her and is of "impeccable integrity." She added that the whistleblower made the tape in person and brought it to her. The recording fills a critical gap in understanding the policy of separating families at the border. There's been a lot of debate about the policy such as where it came from and who started it, ProPublica's Thompson says. But those discussions have taken place at a "sanitized level, where we talk in sterile political terms," she says. "The voices that have been left out of that conversation are the voices of the people with the most at stake, who are these children," Thompson says. "Unless we hear from the children, we don't have a real understanding of what it is, of what this policy is, and what it's doing." This is a source that has had access to this facility, has had access to this facility on a number of occasions, and has legitimate reason to have access to this facility, and has access to the people who are in this facility. I can't tell you who the person is and I can't tell you what the person does because that would identify the person. And that person is justifiably worried about retaliation for making this recording. It was not edited. ... I spoke at length with the source about having all of this audio, and had a long discussion about why we would not accept a tape that was edited. A lot of times journalists, what we do to try to explain a reality — a big reality that involves thousands of people — is we try to find one case, go in deep on one as a way to show a larger reality. Could we say that this is what it looks like in every place? I don't think we purport to say that this is what it looks like in every place. But we say that this is certainly what it looks like here. And if it looks like this here, it raises questions about what it looks like in other places, and I think gives some indication of what things might look like in other places. Not according to my source, who as I've said, has had access to these facilities for a while, and has seen these kinds of separations and has been in the middle of this policy for a while. So no, I got no indication from this source. This was an average day at a Border Patrol facility. One of the things you can hear fairly clearly are consular officials talking to the kids and trying to console them. There is one point where one of the officials talks to a kid, is handing the child a toy, and then they're trying to urge the kids to eat something and they're handing out snacks, and they're asking the kids where they're from. And the Border Patrol official is also trying to console the kids. And I think in his comment about the orchestra, he's kind of, I think, trying to lighten the mood and maybe clumsily trying to joke with the kids. It's just clear from the tape the kids are inconsolable. It was shocking, to be honest. I have lots of small children in my own family, and their voices kept ringing through my head as I was listening to the voices of these kids and thinking about what must these kids be going through. It's just incredibly powerful. A recording of migrant children crying for their mothers and fathers has gripped the nation and ratcheted up the debate over the Trump administration's policy of separating families at the border. The recording runs seven minutes, and those seven minutes provide a rare view into the detention facilities where children are being temporarily held. Let's listen. KELLY: What you hear there is a man's voice saying, well, we have an orchestra here. What is missing is a conductor. Ginger Thompson of the investigative news organization ProPublica obtained this recording from a civil rights attorney who works in the Rio Grande Valley, and Ginger Thompson joins us now. Hey there. GINGER THOMPSON: How are you? KELLY: Fine, thank you. I want to ask you what you thought when you first heard this recording. THOMPSON: It was shocking, to be honest. I have lots of small children in my own family, and, you know, their voices kept ringing through my head as I was listening to the voices of these kids and thinking about, what must these kids be going through? You know, it's just incredibly powerful. KELLY: I need to ask you some questions about the provenance of the tape and what you've done to go about trying to authenticate it. You got the recording, as we mentioned, from a civil rights attorney. Her name is Jennifer Harbury. I want to play what she told CBS News about the person who gave her the audio. UNIDENTIFIED PERSON #2: In person. HARBURY: ...And brought it to me. KELLY: Ginger Thompson, you have also spoken to that whistleblower. Can you tell us who it is, what they might have been doing in this facility that they were recording in? THOMPSON: I can tell you this, Mary Louise. This is a source that has had access to this facility, has had access to this facility on a number of occasions and has legitimate reason to have access to this facility and has access to the people who are in this facility. I can't tell you who the person is, and I can't tell you what the person does because that would identify the person. And that person is justifiably worried about retaliation for making this recording. KELLY: Do we know whether this audio was edited? THOMPSON: It was not edited. THOMPSON: I spoke at length with the source about having all of this audio and had a long discussion about why we would not accept a tape that was edited. KELLY: So you were assured it was not edited, and you found no evidence to the contrary. KELLY: I guess what I'm driving at is this question. KELLY: Is it possible to judge how representative this recording is of what's happening at these detention facilities? THOMPSON: Well, a lot of times journalists - what we do to try to explain a reality - a big, you know, reality that involves thousands of people - is we try to find one case, go in deep on one as a way to kind of show a larger reality. Could we say that this is what it looks like in every place? I don't think we purport to say that this is what it looks like in every place. But we say that this is certainly what it looks like here. And if it looks like this here, it raises questions about what it looks like in other places and I think gives some indication of what things might look like in other places. KELLY: But you get what I'm asking. Is it, in your mind, a possibility at all that this was a particularly awful seven minutes taken out of context? THOMPSON: Well, not according to my source, who, as I've said, you know, has had access to these facilities for a while and has seen these kinds of separations and has been in the middle of this policy for a while. So no, I got no indication from this source - this was an average day at a Border Patrol facility. KELLY: I want to ask you about one moment on the tape. We hear it sounds like a little girl trying to call her aunt, and she recites her phone number. Let me play that. UNIDENTIFIED CHILD #1: (Speaking Spanish). KELLY: So she starts reciting a phone number. You took down that phone number and called and reached her aunt. What have you learned about the girl and her aunt? THOMPSON: So this is a little girl who has come to the United States from El Salvador. And her aunt tells me that this little girl and her mother had traveled more than a month from El Salvador across Mexico and across the U.S. border to get here and that they were intercepted fairly quickly as they made it across the border and, you know, that they were taken to a Border Patrol facility and that the separation happened pretty quickly. KELLY: Do we know if this moment where that was in the chronology? Is this right after the separation, or do we know? THOMPSON: Well, the source who provided us the tape said that the children who were being recorded had been in this facility less than 24 hours. KELLY: Can you paint me any more of a scene of what was happening at the moment this recording was made? THOMPSON: Well, one of the things you can hear fairly clearly are consular officials talking to the kids and trying to console them. There is one point where one of the officials talks to a kid and is handing the child a toy. And then they're sort of trying to urge the kids to eat something. And they're handing out snacks, and they're asking the kids where they're from. THOMPSON: And then the Border Patrol official is also trying to console the kids. And I think in his comment about the orchestra, he's kind of, I think, trying to lighten the mood and maybe, you know, clumsily trying to joke with the kids. It's just clear from that tape the kids are inconsolable. KELLY: Are past that, yeah - where do you think this recording, these seven minutes - where does it leave us in terms of our understanding of what's going on at the U.S. border? THOMPSON: Look; I think that there's been a lot of debate about this policy and where this policy came from and who started this policy. And there's been sort of an effort to kind of keep it at a somewhat sanitized level where we talk in sort of sterile political terms. I think the voices that have been left out of that conversation are the voices of the people with the most at stake, who are these children. Unless we hear from the children, we don't have a real understanding of what it is, of what this policy is and what it's doing. And what we are hoping is that that's what this tape does - is provides a sort of real look at what the policy is and what impact it's having on children. KELLY: Ginger Thompson, senior reporter with ProPublica, thanks very much. THOMPSON: Thank you. Transcript provided by NPR, Copyright NPR.